LÜTZE has expanded the successful LOCC-Box series of intelligent current control system modules to include a two-channel version with unipolar switching. The specific characteristics desired by the customer are individually preset as the factory setting. Status messages are issued separately for each channel. 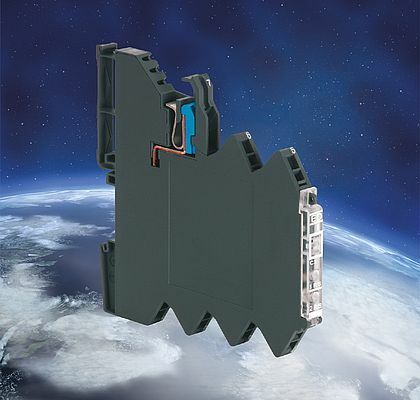 The new two-channel LOCC-Box is suitable for recurring currents, such as in machine and tool construction, as well as in wind power technology. The new two-channel LOCC-Box impresses with its very good price-performance ratio and can be used in DC 12 V and 24 V circuits. With the new LÜTZE LOCC-Box current ranges from 1A to 6A can be set in 1A increments. Status indications for each signal use a green LED (output 1) and a red LED (output 2) to indicate the connected operating voltage, load and faults in the load circuit. Both channels can be switched on and off independently of each other. The LOCC-Box is connected on the input side via a screwless contact slide that allows a galvanic isolation when servicing is necessary. The new LOCC-Box complies with the standards EN 60950-1, EN 61131-1,2, EN 61000, EN 60947-4-1 and EN 55022, and the approvals cULus (E135145) and GL.